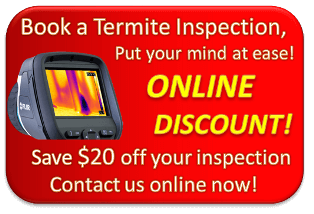 This species of termite is rampant throughout South East Queensland, and can cause major structural damage to softwood and hardwood timbers. This is the most destructive termite species in Australia and can be found across most of the Australian mainland. Although relatively small in size, this species of termite is capable of causing large amounts of damage in a short period of time, and are most commonly found in or near bushland. Significant damage to sound timber in service is considered a rare occurrence as this species of termite prefers decaying hardwood. This termite species can damage timber in service however prefers weathered and decaying timber. Damage to gyprock walls is very common. Although most infestations result in minimal damage, repairs can be quite expensive when these little critters are left too long. One of the smaller Termite species with a seemingly large appetite for destruction.